Greetings to you, dear reader. In today's tutorial, I’ll tell you how to sync your iPhone with iTunes, how to set up your gadget, how to do it easily and quickly. In fact, the procedure for synchronizing all Apple devices (iPhone, iPad, iPod) is the same, so after reading this manual you will learn how to synchronize any Apple gadget..
With the connection of the gadget (iPhone, iPad, iPod) to the computer via USB cable (this cable had to be bundled with the gadget). 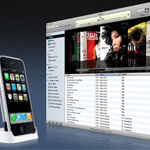 The easiest and most traditional way: you connect your iPhone, iPad, iPod to a personal computer on which iTunes is installed, then add the necessary files to the program and press the sync button. In my opinion, this is the most convenient way to sync your iPhone, iPad, iPod with your computer and iTunes. You do the necessary settings in iTunes. Later you simply connect to your computer via WiFi, then you can synchronize automatically. To the right of the side menu (in the main field, information about yours (iPhone, iPad, iPod) should appear). Go down to the bottom of this field and find the “Synchronize” button, click on it.. Wait until the end of the procedure. Everything, sync iPhone with computer finished, if you synced your iPad and iPod, then the synchronization with your computer is also complete. We turn to, in my opinion, a more interesting version of the synchronization of your gadget (iPhone, iPad, iPod) - to sync over a wireless WiFi network. Below is a detailed instruction on how to configure WiFi. Everything, now you can disconnect your iPhone, iPad, iPod from the computer. It remains to configure the necessary functions in the gadget. Click on the “Sync” button. That's all for today, now you know how to sync your iPad with a computer, or how to do it with an iPhone or iPod.